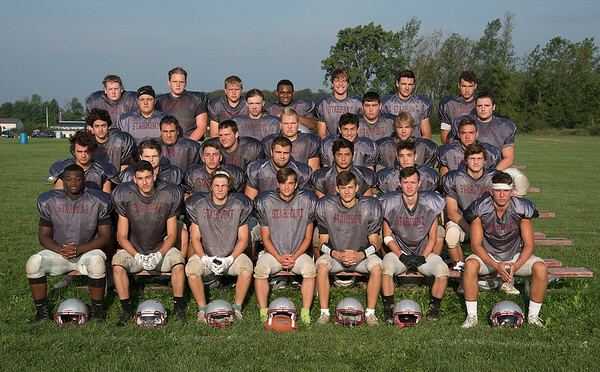 Pendleton, NY - Starpoint varsity football team from left, front: Justin Mott, Nate Lang, Brendan Gawel, Matthew Warner, Matthew Spina, Erik Miller and Sam Mazzara. Second row: Donny Voss, Griffin Mack, Ethan Majewski, Anthony Robinson, Rob Roetzer, Mike Hayes and Aaron Chase. Third row: Branden Postula, Tony Osika, Kevin Johnson, Sam Hallock, Alex Olson, Erik Schwarzmueller and Dalton Zieniewicz. Fourth row: Kyle Schreader, Colt Dold, Tom Fratello and Mike Parisse. Back row: Jasper Terrazzino, David Meyer, Collin Meal, Kendall Brooks, Max Bowden, Josh Brooks and Jake Ruchala.